Vacation rental condominium. Sleeps 6, 3 bedrooms, 2 bathrooms. No pets allowed. 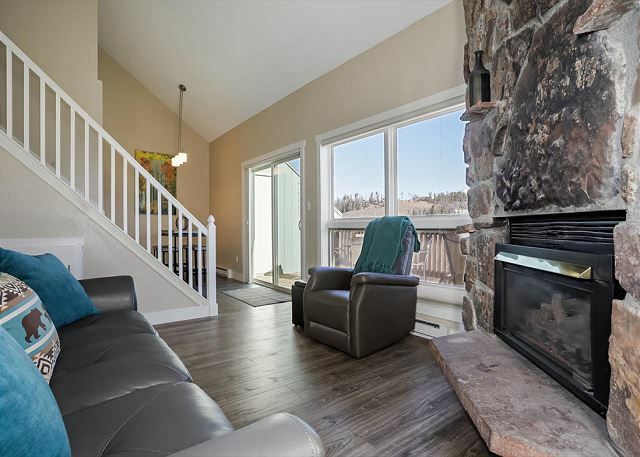 This newly renovated 3 bed, 2 bathroom condo is the ideal mountain retreat! 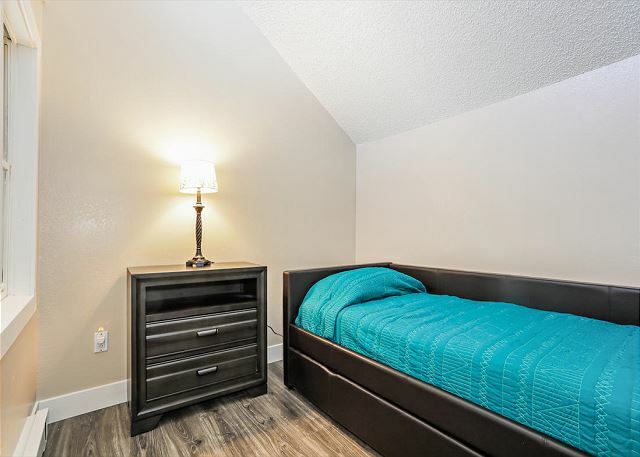 Spacious two story with beds for 6, dressed in new linens and bedding. Private deck with incredibly beautiful views of the Fraser River and surrounding mountains. 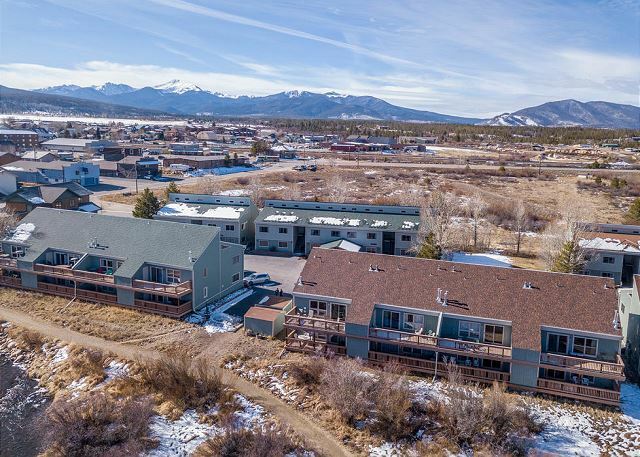 This updated unit is a real standout in the Twin Rivers complex. High end furnishings, fireplace, updated kitchen and bathrooms, this unit has everything you will need. Although the inside of this unit is magnificent, the outside is where you will want to spend your time. The massive patio sits right above the Fraser River and the beautiful trail that follows it, winding all the way around to the Winter Park Resort. The Twin Rivers complex hosts plenty of parking, an outdoor volleyball court and picnic area, and of course access to the Fraser River Trail. The Clubhouse at this complex includes 2 indoor hot tubs, coin operated laundry, lounge, and saunas. 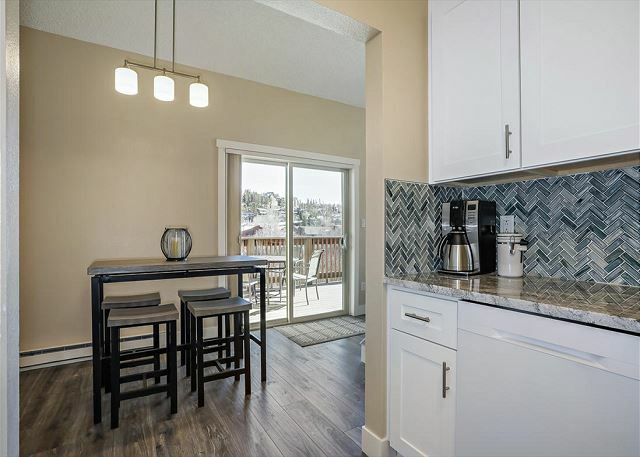 From this excellent location, you can walk into town for shopping, dining or to the park, or you can hop on the convenient free shuttle that picks up right at the entrance! We know you will enjoy your stay at Twin Rivers Perry, and we are certain you will be back for years to come! WE PLAY BY THE RULES! 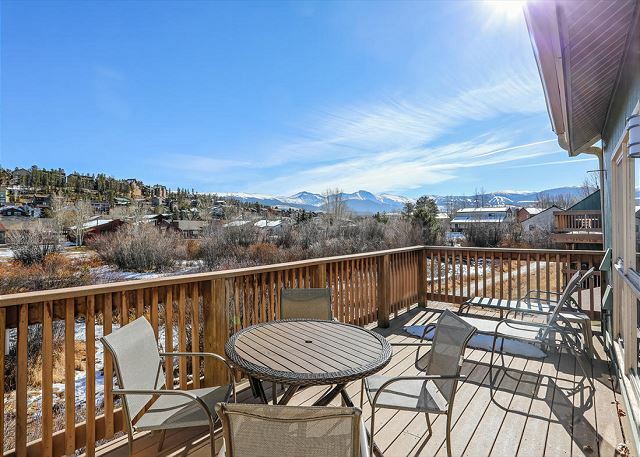 This vacation rental is professionally managed by a local property management company based in Winter Park, Colorado. We follow all local & state rental regulations and we remit all sales and lodging taxes to the proper entities. Our reservation totals include all applicable taxes, cleaning fee, and Accidental Property Damage Protection. WE ARE HERE FOR YOU! Our team is local, some even born and raised, and we're committed to providing our guests with exemplary service both before and during your stay. If concerns arise, you can rest easy that we will address it quickly, so your vacation can continue. WE'VE GOT YOU COVERED! 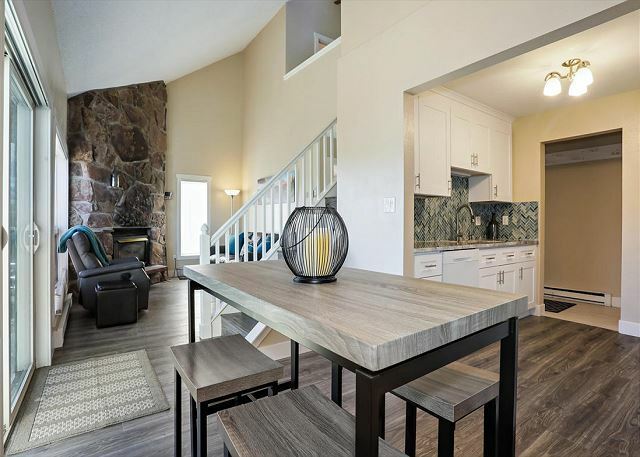 When you arrive, your property will be stocked with all the essentials like clean towels, fresh linens, cozy blankets, Gilchrest and Soames bathroom products, and all cooking tools including paper towels, dish soap and sponges. Your property will be inspected just before you arrival to ensure lights are on to greet you and the home is a perfect temp. GET GREAT GEAR! Guests of Mountain Chalet Properties receive discounts on ski, snowboard and bike rentals from the best shop in town! We are happy to help you book your gear in advance and save up to 25%. Amy C from Broomfield, CO does not recommend this vacation rental. Great location, easy to find , comfortable beds, and a fully stocked, great kitchen. The jacuzzi s were very good. The parking lot is not well maintained when it is snowing. I fell on the ice because parking lot isn’t well lit and no salt is used in the lot. Our unit was noisy and the floors were all extremely cold. You had to wear socks or shoes .There is nothing in the unit to absorb noise. We received only one towel for the jacuzzi and 6 towels for bathing . We had 5 people staying in our unit. TV is in the loft which only has one couch. When I inquired about canceling this property it took 3 days for a return call. I was surprised to find that home away charged a fee. I only called them to verify the property had a pool and jacuzzi. There was nice jacuzzis but no pool. Eric the on call service guy was very responsive and was great. We skied, and snowmobiled. We cooked one night , had pizza and Chinese food. The table in this picture is actually upstairs in the loft. The dining room chairs must make a lot of noise as we were sitting at this table and the neighbors below come up and said we were to noisy for their kids to sleep. We were surprised! We were just visiting and baking cookies after dinner. If you like to stay up past 9:00 PM or have small children I would not recommend this property. Awesome spot for a mountain get away. Very clean, very updated, and great hosts! Would recommend this spot to anyone wanting to stay in the area! We were very happy with the condo. Perfect location and very clean and updated. We had 2 issues: 1. The bathroom light would not go on which made the bathroom very dark. (Management co took care of the breaker issue). 2. The upstairs toilet would not refill after being flushed. Took forever for the water to fill up the tank again. Needs to be looked at. We appreciated coffee being supplied and thanks for the wine and power bars. We would rent this unit again. We are so glad you enjoyed your stay with us and even extended an extra night! Thank you for the info on the toilet, we have repaired the issue! We look forward to hosting you again! -Mountain Chalet Properties! Our stay was awesome! The condo was spacious and clean. The beds were super comfortable and all the linens felt like they were freshly laundered. The location was perfect (about 6 minute drive from condo to Winter Park) and the jacuzzi is located in the building right across the parking lot which made it easy to go back and forth. 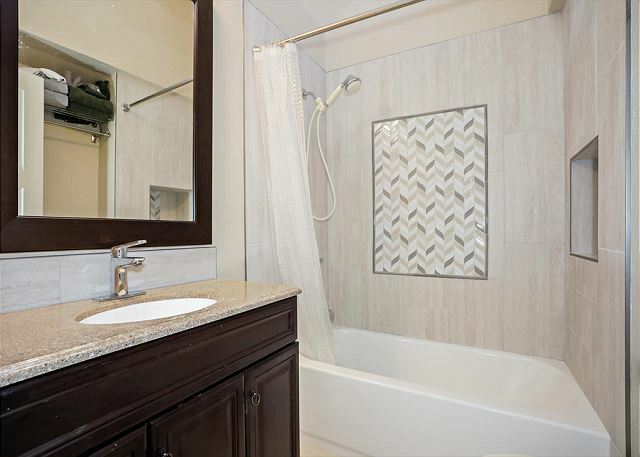 This is a newly remodeled unit that is beautifully done. The kitchen is supplied with everything you'll need. I consider myself picky about beds and their mattresses are brand new and very comfortable. My one complaint is the fees add up to over one night stay, so this might be most affordable for those staying a week or more.